Portable Storage Closet With Wheels. 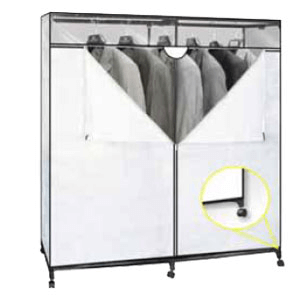 This Closet Features A Dust Proof Storage Cover And Provides Extra Storage Space For Suits, Dresses, Jackets And Shirts. Available In Three Colors: White, Navy Blue And Beige. Strong Construction. Easy To Assemble.